Chorazin is one of three villages most closely associated with the earthly ministry of Jesus. Excavations at Chorazin have revealed both a chair described by Jesus and an inexplicable image of a monster. During the first century, Chorazin (or Korazin) was a Jewish village set on a hillside north of the Sea of Galilee. The village, known for the quality of its wheat, was about two and a half miles due north of Capernaum, the center of Jesus’ ministry. According to the Bible, Jesus performed most of his miracles in Chorazin, Capernaum, and nearby Bethsaida. Because the people witnessing those miracles did not repent, Jesus expressly cursed all three villages by name, beginning with Chorazin. As a result, early Christians expected the Antichrist to be conceived in Chorazin. Later Christians believed Jesus’ curse explained why a fourth-century earthquake destroyed Chorazin, by then an important city. Although archaeologists have not yet found the remains of first-century Chorazin, they have uncovered ruins from the third century. In the middle of the 25-acre city was a large synagogue, constructed of black basalt, a volcanic stone. 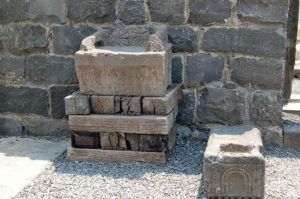 In 1926, excavators found a chair, carved from a single block of basalt and inscribed in Aramaic, near the wall of the synagogue that faced Jerusalem. Scholars believe the stone chair was the so-called Seat of Moses. According to Jesus, as quoted in the Gospel of Matthew, rabbis made authoritative pronouncements from the Hebrew Scriptures while sitting in this chair. The original chair is in the Israeli Museum in Jerusalem, but a replica lies along the southern synagogue wall. Curiously, the Chorazin synagogue also featured a stone relief of the head of snake-haired Medusa. Why a synagogue used for worship by people forbidden to have graven images would include the representation of a monster from Greek mythology remains a mystery.